That’s a 50% loss among the 20% of workers who come from the EU. A loss to the rail industry, therefore, of one in ten employees. To a regular commuter, this may appear an overestimate - we all encounter foreign accents on the train. But one in ten? “This is more of an infrastructure problem than an operations problem,” Robertson continues. “The impact will be felt most strongly in the South East, where finding alternative workers will also be most difficult. “The percentage of EU workers in Network Rail is very low - 2% or 3%. In the train operators it is 8% to 10%. So at the top of the supply chain it doesn’t look too bad, but when you look lower down the chain it’s a disaster waiting to happen. “In operations you are looking at retail, hospitality staff, people on the platforms, security, and particularly cleaning staff. Train presentation teams are 80% non-UK nationals in the area broadly south of Derby. In general, this is a south of England problem. In the absence of official data, NSAR has contacted supply chain companies to assess numbers. Robertson says some staff will be asked to stay on. Some will go back because it is economically better for them to do so. Those who have worked for a while to send money home to their families will find staying less attractive. And others will tire of what he calls “casual racism”. “Firstly, we will get wage inflation, which is already running at 6% in infrastructure. We think this will go up to about 9% - a new increase in wages among skilled trades of 9%. NSAR advocates recruiting and training a larger number of apprentices. No surprise there. Robertson continues: “It’s a question of scale. Is there sufficient capability in the training industry? No. Can companies fill the gaps with apprentices? No. The answer, therefore, will be to seek workers from abroad. Robertson reckons the rail industry is ahead of the game here because it has strong data to identify the scale of the shortfall. 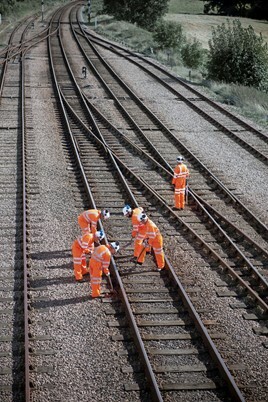 He has made a submission to the Migration Advisory Committee, with a view to listing railway infrastructure skills as an area of focus in the UK’s points-based system for admitting skilled migrant labour. “For graduate engineers we will be fine. We will get them from the Philippines and elsewhere. Our biggest shortage is at the lower end of the scale. The points-based system has not served semi-skilled people well, and I don’t believe it will in the future. “Under the points-based system you need a bit of paper from a reliable institution to prove you have the skills we need. Generally people at levels 2 and 3 don’t have that bit of paper. And there isn’t the capacity among the processing teams who would have to clear these people to work in the UK. “I have heard ministers saying the points-based system is the answer to getting in migrant labour after Brexit. I don’t want anyone to be misled by that. It will not work for us in the way they are describing. That’s not just my opinion, it’s fact. The core employment in the rail industry and its supply chain is 240,000 people, according to NSAR. That excludes cleaners, retail staff and extras such as taxi drivers. If the estimates prove correct, 25,000 of those will leave over the next three years. “In every area of business we make contingency plans,” says Robertson. “We plan for earthquakes, we plan for fires, we plan for growth or we plan for contraction. But we are not planning for a shortage of labour. “Could we find efficiencies of 10% to accommodate that? Possibly. But finding efficiencies through driver only operation has proved very hard to do. There are only so many efficiencies that can be made in train cleaning. We have picked the low-hanging fruit already. NSAR is a lone rail voice on this subject. We have not heard the big rail infrastructure companies speaking out in the way we have seen from Honda, BMW, Toyota and Nissan in the car industry. Why is that? “Employers are terrified to talk about this stuff because they are worried about the backlash from reckless politicians. And the accusations of casual racism. “Everyone reading this will privately agree. But when I try to have a discussion about it in official circles, it is closed down. The political atmosphere could not be more febrile. Companies do not want to be named and shamed - they don’t want to offend the Brexiteers in their own workforce and they don’t want to end up on the front page of the Daily Mail. “We have to assume we will have not a hard Brexit, but a soft Brexit - and if possible with a transition,” says Christine Ourmières-Widener, chief executive of regional airline Flybe. Headquartered in Exeter and employing 2,400 people, the company has a fleet of 74 aircraft operating across Europe. Its principal hubs are Manchester, Birmingham and Southampton airports, where strong rail links are key to marketing. 70% of its business is UK domestic flights, with 30% into mainland Europe, and a 50-50 balance of business and leisure travel. “First of all, this is about our people - our staff and our customers,” says Ourmières-Widener. Although Flybe operates only within the UK and western Europe, it sees itself as a global organisation, and believes there are parallels with rail operators. “It is important that goods can move across borders without difficulty,” says Ourmières-Widener. “Our planes are Bombardier from Toronto, and Embraer from Brazil. Our engines are from the USA. Our spare parts are from all over the world. We do maintenance in Exeter, but our engines are serviced partly in Europe and even in the US. Our planes are leased in dollars, our fares are largely in pounds, and we pay many landing fees in Euros. Roy Kinnear is Flybe’s chief commercial officer. “We cannot bring our business to a stop just because the political situation has not been sorted out,” he says. But right now, there is no legal framework in place to permit Flybe to operate outside UK airspace. “That is correct,” says Kinnear. “But we cannot allow that to stop our business. It is a risk. We just have to hope that common sense will prevail. “Operationally, we hope it will not have a big impact. We have 12% of employees from Europe and we want them to stay. Also, the majority of our aircraft work from bases within the UK. At night most of those aircraft return here. Freightliner believes the carriage of freight by rail will diminish under Brexit. This may, at first sight, appear counter-intuitive. Freightliner is owned by the American company Genessee and Wyoming. It does no international business and operates entirely in the domestic market. What’s more, it is key to the container terminals of Southampton and London Gateway - deep sea ports that do little EU trade and principally carry goods to and from the rest of the world. Also, Dubai Ports World (which operates Southampton’s container terminal) and Dubai-owned ABP (which owns the wider port) have both spoken of positive growth opportunities following Brexit. They see trade with the rest of the world offsetting any reduction in trade with our closest neighbours. However, Freightliner’s Head of Rail Strategy Lindsay Durham explains: “Container traffic is a bellwether of the economy. We think the economy will dive. The economic impact is seen first in the movement of containers. If people buy less stuff, we carry less stuff. “We have found it difficult to plan ahead because we do not know what the EU deal will be. And we do not know what will happen to the movement of goods through the Port of Dover - will border controls force more traffic to switch to alternative ports? We have absolutely no certainty of what will be happening even this time next year. GB Railfreight Managing Director John Smith concurs: “It is hard to persuade our owners to invest in the UK rail freight market. There is more ‘wait and see’ since the Brexit decision. “Our trade is mostly domestic, but the money isn’t. We are owned by Swedish private equity. We are raising debt on a European basis. A proportion of our Class 66 locomotives are financed on debt from a German bank. People aren’t saying ‘no’ to lending money. But they are saying they will wait, rather than committing now. “That’s because we can’t answer their questions about future demand. Look at the aggregates market, which is important to us. The Government will have to stimulate it in some way, to lift demand. We see a reduction in spending on construction, particularly in the London area, that is specifically related to Brexit. There is less demand for cement and stone because we aren’t building as much. You can sense the nervousness. “We have a small operation through the Channel Tunnel. For example, we do a train from Duisburg in Germany. It’s the China train that brings containers across Asia. We don’t understand yet how the customs clearance at Fréthun will work. We have no idea how - or even whether - it will function. “From a business perspective, if this ends up being a Brexit with no agreement it will be disastrous. Carnage. They’ve got to kick that can down the road in some way. “Like Freightliner, our wagons are from Poland and Romania, both makers owned by Greenbrier, which is American-based. And our locomotives are from America. “The first hit was the exchange rate fall after the referendum. Our last Class 66s were bought at $1.70 to £1. They’ve now become 20% to 30% more expensive. We had an order on wagons in at the time - they immediately cost us 20% more. We’re now buying in some older kit, because new equipment is unaffordable. “I hate dealing with risk that I can’t manage. The whole system of running a business is built on risk. We can load it, run it, buy a locomotive, build relationships - managing risk is what we do. But this… this is beyond our control. We have very high fixed costs. We can stop a train running but we still have the locomotive, still have the wagons, we still pay the driver. We save a bit on wear and tear, but that’s about it. “The business is well-run, we have a good reputation, our service standards are excellent and our people are very committed to what they do. We are in a better place than others to survive this. What I don’t like is that we are talking about the hard times that lie ahead. It shouldn’t be like this. “At a personal level I want to be spending my energy in other ways. I don’t sense that our voices count for a great deal in this turmoil. Rail has lost its leverage following the timetable debacle. Our reputation is tarnished and I’m not sure politicians will listen to rail leaders as closely as they once did. If you are a committed Brexiteer, you may take offence at a perceived imbalance in this article. There are views from people worried about leaving the EU, but none of significance from people who see it as an opportunity. Secretary of State for Transport Chris Grayling has consistently been one of the leading supporters of Brexit. He is convinced that it will be good for the economy. But that view is not widely shared within the industry over which he presides. No bias here is intended. In fact, RailReview actively sought out people with opposing views. But in the rail industry, there aren’t many of those. We found this problem in our first debate two years ago - on this subject, the rail industry is nowhere close to being representative of wider society. Speaking on or off the record, we did not encounter a single train operator, infrastructure organisation or supply chain company that thought the rail industry would function better outside the EU than within it. The National Skills Academy for Rail believes this picture is accurate. Flybe says the picture is similar across aviation. And it is equally true among cross-Channel ferry operators. The RMT union advised its members to vote Leave. It believes that EU membership would entrench rail privatisation and fragmentation, making it impossible to return the industry to public ownership. Most other unions, and the Trades Union Congress, favoured Remain. The TUC believed wages would fall, manufacturing jobs would be lost, and employment rights put at risk. “We’ve been working on it since the day of the referendum. We’ve been identifying all the touch points with Europe,” says Laura Wright, head of international policy at the Rail Delivery Group. Which of those is the RDG’s area of greatest concern? “It keeps changing because of the febrile political situation. But my biggest fear is ‘no deal’. The risk of leaving without any trade agreements in place. We can make all the risks associated with leaving manageable, but only if we have enough time. So a deal and a transition period of two years could work. Although the outcomes are not necessarily what the industry would want, it could cope. Wright heads a team of three people working on behalf of the industry. As things stand, Eurostar trains would stop running on Brexit day because no agreement is in place. Similarly, no aircraft would fly to European destinations and no EU planes would cross British airspace on their way across the Atlantic. “I genuinely think that is not going to happen,” says Wright. Wright underwrites NSAR’s fears about the 20% of industry’s non-UK workers from the wider EU. The industry will need to replace 100,000 employees over the next decade through natural staff turnover. “We will get a deal for highly skilled people - the visa system will manage that. And I think there will be a ‘barista visa’ for the volume of lower-skilled people. “It’s the portion in the middle we are most concerned about. People who are trained for six, nine or 12 months on specific plant or machinery. Or labour that moves around Europe on specific jobs, such as operating particular bits of Network Rail yellow plant, which come with gangs of people. People in the mid-skill range, such as bilingual drivers on trains through the Tunnel. Having a skill such as a language won’t class as high-skilled, but it certainly isn’t low-skilled. And we don’t have a pipeline of people in the UK who are proficient in other languages, because schools are not producing them. The RDG believes the recent White Paper on Brexit adds complexity to the minefield of maintaining common international standards. It has brought different industry groups together with the supply chain under one umbrella, to agree a single position. This assumes that the UK railway will continue to apply European standards unless there is a whole-industry, whole-lifecycle agreement to diverge. It will be decided by a representative body that will probably sit within RSSB. Wright says that convergence with Europe will generally be appropriate, with the possible exception of some remote parts of the network. “But it’s no good that decision to diverge being made by one party because it happens to be cheaper for them at the time, because that could make the supply chain more expensive overall,” she warns. A series of technical workshops is currently under way to understand how standards could be applied in future. Wright continues: “On April 1 next year we are not going to start changing the standards. This is a slow-burn concern. “The more pressing issue is the uncertainty of ‘no deal’. The Government has made it clear it does not want to participate in European agencies, other than the European Medicines Agency and a couple of others. “We have been told we won’t be in the EU Agency for Railways. But that is where we have been very successful in influencing standards, so my fear is that we might soon be implementing standards over which we have had no influence at all. “We are pushing Government to let us have membership of the Agency for Railways, and we think we meet all the criteria for that from the White Paper. If that doesn’t happen, then we will look to have a bilateral agreement with the agency. But that would reduce our influence. In other words, there are as-yet unidentified issues that will challenge the rail industry between now and the end of March.